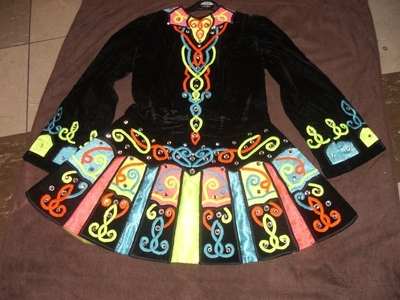 Lovely black velvet and multi-coloured dress suitable for age approximately 10-11. Panelled gladiator style skirt with various colours of embroidery. Rainbow sash to match the colours on the front. Many crystals on the dress make it sparkle on stage. Matching headband and kickpants included. From a pet and smoke free house. No odours. Made at the end of 2009 by Marion Hayes, Bristol, UK. Asking Price: £275 ono to include shipping.